Extend the the shelf-life of a cut pepper. Place it in the Pepper Saver and keep your cut peppers fresh and moist. 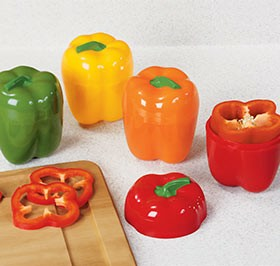 Also great for serving sliced peppers at picnics and barbecues. Designed to look just like a pepper, this will never be lost and forgotten in the fridge. Made of plastic, the 2 sides attach by twist lock. Dishwasher safe. Assorted colors.